New York, Toronto. Journal and organ of the International Bolshevik Tendency. London. The Africa in Struggle journal was a an attempt by supporters of the International Marxist Group in the GB to build ties with, and win over, revolutionaries in Africa to the United Secretariat of the Fourth International. This journal ran from 1975 through 1978. Included are some pamphlets associated with this initiative. Detroit. Monthly magazine of Solidarity of Solidarity, a feminist, socialist and anti-racist organization which includes supporters of the United Secretariat of the Fourth International. New York. When the Cochran-Braverman group split from the Socialist Workers Party in 1953, it did not attempt to set up another ‘vanguard’ formation. Instead the organization they formed, called The Socialist Union, was a conscious attempt to pursue a different model. In combination with their monthly magazine, The American Socialist, they attempted to start a new Marxist current that would dispense with the sectarian habits of the past. Although the magazine was published for only six years, from 1954 through 1959, it is still very relevant for today’s activists who are trying to construct new revolutionary organizations that are free of dogmatism and sectarianism. This ETOL section is devoted to publicizing the magazine and the efforts of the Socialist Union. The American Socialist articles were scanned by Louis Proyect, who is the moderator of the Marxism mailing list at www.marxmail.org. A. Lehrer also played an important role in transferring the files from the late Sol Dollinger’s Socialist Union website to this location. New York. Launched by the New York Student Federation Against War, an amalgamation of several socialist and radical campus clubs in New York City. For the first two issues, the publisher was listed as the Federation alone; thereafter and up through the 12th issue, to the name of the Federation was added a number of radical and socialist clubs in other parts of the country, the list varying from time to time. The New York Student Federation had never really developed as a going concern apart from the constituent clubs, and it ceased to be listed beginning with the 13th issue. In fact, no student groups as such were thenceforth listed as publishers, the sponsorship being represented only by the editorial board. At its founding the editor was Julius Jacobson. He was eventually succeeded by Bob Bone (10th issue), Margaret Levi (11th–13th), Don Harris (14th), George Rawick (15th–18th), and Michael Harrington (19th–20th). Produced in occupied France during WWII ,this journal was brought out by French Trotskyists in conjuction with German Trotskyists drafted into the German Army and serving in the occupation forces. A description in Yvan Craipeau’s book Contre vents et marées (Against winds and tides) quotes Roland Filiâtre, one of the comrades responsible for this work: “The French comrades started discussions with German soldiers and got them talking and giving hints of their past politics. Once they had shown themselves trustworthy, after screening they were put in touch with the German soldiers who produced Der Arbeiter and then taken care of by their organisation. The Paris region was organised as two branches. But the heart of the organisation was in Brittany, both around Nantes and in particular around Brest where the soldiers provided the party with Ausweis [identity cards] and weapons. In Brest the organisation had about fifty soldiers on average despite some people being posted elsewhere. Contacts were established in Toulon, Valence, La Rochelle and at Conches aerodrome. Links were established with the German Trotskyist organisation, most importantly in the port of Hamburg, in Lübeck and in Rostock. Victor [a German Trotskyist, whose real name was Widelin] was responsible for these contacts. Arbeiter und Soldat was also distributed in garrisons in Italy. On 7 October 18 Fourth International Committees activists in Brittany were arrested, along with much of the Paris organisation. In total around fifty French activists were rounded up, and many of them were tortured, executed or sent to concentration camps. Similarly, as many as fifty Der Arbeiter soldier comrades were put to death, and their paper never reappeared.” New York. This paper started out as the organ of the “American Committee for the Fourth International” that resulted from a split 1964 in the U.S. Socialist Workers Party. Aligned internationally with the Socialist Labour League (Gerry Healy) the paper was initially titled Bulletin of International Socialism. Shortly into the 3rd volume the name simply became The Bulletin and the group publishing it became the Workers League. Unique on the left in the U.S. the paper by the 1970s became a twice-weekly journal and toward the end of that decade, became the first paper to use full color half-tones for color photographs. London. The Black Dwarf was a political and cultural newspaper published between May 1968 and 1972 by a collective of socialists in the United Kingdom. It is often identified with Tariq Ali, who edited and published the newspaper until 1970, when the editorial board split between self-described Leninist and non-Leninist currents. The Leninists, including Ali and other members of the International Marxist Group, went on to found the Red Mole. The Black Dwarf newspaper published a special edition in autumn 1968 devoted entirely to the Bolivian Diaries of Che Guevara, in a translation first published by Ramparts in the United States. It included an introduction by Fidel Castro. This edition appeared to be in response to a version of the diaries put out by “some publishers in league with those who murdered Che”. London. Continuation of the British Bulletin of Marxist Studies. London. Not associated with the US paper of the same name, this is the newsletter of those expelled from Gerry Healy’s Socialist Labour League who sided with the French OCI (International Communist Organizations) associated with Stephen Just and Pierre Lambert. This group was called Socialist Labour Group and represented the OCI’s international current in the GB. London. Newsletter of a British split from the IMG. New York. A journal that reflected in a short period of a few years the politics of the youth of the Socialist Party, the Socialist Workers Party and the Workers Party. Originally titled Challenge it became Challenge of Youth in 1935. Officially the name of the paper of the Young People’s Socialist League, ostensibly the youth group of the Socialist Party of America but controlled by various factions in it. Paris/Grenoble France. This was the journal published by the Leon Trotsky Institute in France. Founded and edited by Pierre Broué the Cahier became one of the most respected journals dealing with the history of Leon Trotsky, Trotskyism and the revolutionary workers movement. Provided here are English Language translations of the original French language journal. Various US cities. Published as a stand alone newsletter irregularly in localized version of the U.S. Spartacist League national college network, with issues published in Austin, NYC, and the Bay Area from 1965 thorugh 1971. Subsequently replaced by the national organ of the official youth organization of the Spartacist League (the Young Spartacus League) called Young Spartacus (see below). London. The monthly magazine of the British Marxist Group and Revolutionary Socialist League from 1936 through 1938. The collection here is made from a facsimile reproduction published in the 1990s. New York/Chicago. Newspaper of the Revolutionary Workers League (1936 through 1953), a split from the U.S. Workers Party of the U.S., was lead by Hugo Oehler. The RWL was an early split from the Workers Party of the U.S., the U.S. supporters of Leon Trotsky and the International Left Opposition. The RWL ceased calling themselves Trotskyist from 1938 onward. Their original opposition to the politics of the Workers Party revolved around the 1936 entry of the Trotskyists into the Socialist Party. Kingston, Jamaica. The organ of the Jamaican Revolutionary Marxist League (RML), the only Trotskyist organization ever to exist in the West Indian island nation. The paper initially carried the descriptor “Propaganda Organ of the Revolutionary Marxist League” and while that was replaced with “Break the Chains, and let Workers and Small Farmers Rule!” Forward carried on propagandizing for the need for socialist revolution while focusing on the Jamaican labor scene, the post independence political struggles in Jamaica and other West Indian nations as well as making concerted efforts to address the international class struggle though a regular column entitled World Revolution. Because of the RML’s fraternal relations and later fusion into an international tendency with the U.S. based Revolutionary Socialist League (RSL), it sometimes reprinted articles from the RSL’s organ the Torch. Forward also carried two regular columns, Picket Lines and Woman’s Fight. The first issue of the paper was published in November 1975 and the last issue available in this index is from March–April 1982. There is a complete index for the years 1979–1981, however, since the creator of the index does not have access to a full catalog of the journal some issues are missing for the year 1978, there are no issues available for the year 1976, the year 1977 is incomplete and since so little is known of the RML, there is no clear indicator when the last issue of the journal was published. New York. This journal represented the continuation of Trotskyist politics in the United States after the tendency in the Socialist Worker Party that formed around Max Shachtman split and took the SWP theoretical journal with them, New International [see entry on NI below]. The FI index is in two parts: 1940–1945 and 1946–1956. In 1956 the magazine was renamed International Socialist Review. The index for ISR goes up to March 1970 at the moment. FI was the leading English language theoretical voice for the Fourth International during it’s existence. Whole issues of the magazine were digitized into PDFs and individual article are often put in the from of HTML for easy web viewing under their author’ internet archive here on the MIA. These articles are linked from each issues table of contents. Amsterdam, Rome, Colombo. The English-language edition of the theoretical organ of the International Executive Committee of the Fourth International. Published for the International Secretariat of the Fourth International, the pro-Pablo wing of the split Fourth International. Livio Maitan, Pierre Frank, Michel Pablo and Ernest Mandel. London. International journal of the International Committee for the Fourth International that formed after a wing of the ICFI, lead by the US SWP, reunified with the International Secretariat of the Fourth International in 1963 to form the United Secretariat of the Fourth International (USFI). This ICFI attempted to maintain those pre-unification perspectives of the original ICFI. Fourth International published for the ICFI by the Socialist Labor League (later called the Workers Revolutionary Party) of the GB, grew out of the SLL’s own theoretical magazine, Labour Review. Journal of the Freedom Socialist Party. The FSP arose from a split of Seattle Branch of the US Socialist Workers Party in 1966. It published two issues then took a 10 year hiatus before resuming regular quarterly publishing in 1976. New York. Journal of the Leninist League. This group was the result of a series of splits that originated with Socialist Workers Party of the U.S. in 1936. The first split resulted in a group calling itself the Revolutionary Workers League and lead by Hugo Oehler and Thomas Stamm. In 1937 a split occurred in the RWL that resulted in two organizations both claiming the name “Revolutionary Workers League”, both published in Chicago. At the same time, George Marlin left the RWL to form the “Leninist League” with about half a dozen members at the most. It created for itself a space to polemicize with both wings of the RWL, the SWP and the Trotskyist movement as a whole, something Marlin and his comrades rejected formally. Marlin’s nom-de-plume was George Spiro. In October of 1939 the name of the publication changed to The Bulletin of the Leninist League, U.S.A. City from which it was published is unknown. Newspaper published by G.I. supporters of the U.S. Spartacist League. It was short lived and represented more of a probe by the SL than an overall orientation. San Fransisco. Independent Politics was published by Activists for Independent Socialist Politics (AISP). AISP originated as a split from Socialist Action in 1992. AISP’s main objective is to promote the idea of independent political action and rebuild a mass socialist movement in the United States. Members of AISP are activists in the trade unions, women’s and Black liberation movements, and many other social struggles. London. Journal of the International Group. The International Group was a significant split from the International Marxist Group/Socialist League in 1985. Formerly the largest minority, Faction One, led by Phil Hearse, Dave Packer, Davy Jones, and Bob Pennington, they left after two smaller minorities formed what they regarded as an unprincipled alliance to block them from the leadership of the group. They published nine issues of International – A journal of Marxism in the Labour Party before fusing with the Socialist Group (formerly Workers Socialist League) in 1987 to form the International Socialist Group which then published Socialist Outlook. The IG/ISG considered itself to be a sympathising section of the Fourth International (USFI) and became the official section at the 1995 World Congress. The tendency of Workers Fight continued to organize in and outside the British International Socialists and itresumed publication of Workers’ Fight, now as a printed paper, not as was previously the case as a duplicated journal, began publication of a theoretical journal entitled Permanent Revolution and made efforts to publish a small number of workplace–oriented publications in specific industries. At the end of 1975, it fused with the smaller Workers Power group, formerly the Left Faction within the IS, to form the International–Communist League. A small group of members in Bolton and Wigan opposed to the merger formed the Marxist Worker group, which later fused with the International Marxist Group. Workers’ Fight was renamed Workers’ Action and went over to a weekly publication schedule and the group’s quarterly magazine was now entitled International–Communist. London. The International Bulletin (later renamed simply The Bulletin) was the second publication (the first was titled the The I.F. Bulletin) of the International Group, affiliated to the International Secretariat of the Fourth International (ISFI) in Britain. It was a mimeographed sheet designed to begin to unify the somewhat isolated individual and groups of Trotskyists throughout Britain. The International Group would later morph into the International Marxist Group, the British Section of the USFI. Paris. Imprecor was established as a weekly news magazine of the United Secretariat of the Fourth International’s International Majority Tendency to compete with Intercontental Press also as a magazine published in solidarity with the USFI as well but under the control of the U.S. Socialist Workers Party and the Leninist-Trotskyist Faction. In 1977 it was merged into Intercontental Press when the international factions dissolved. New York, then Berkeley. Journals of the International Socialist tendency in the U.S. which published continuously but variously under these 3 names from 1967 through 1978.The IS was the largest derivative of the Independent Socialist League which moved to the right and merged with the Socialist Party in 1959. The IS tradition was carried forward by former members of the ISL who continued their adherence to Trotskyism. New York. Organ of the Internationalist Group. A split from the US based Spartacist League in 1996. Active in New York City's community collage/university system. Also produced Revolution, youth paper of the IG and El Internacionalista, Spanish language version of The Internationalist. Minneapolis: Motor Transport and Allied Workers Industrial Union, Local 544 (CIO), 1941–42. Weekly. Edited by Miles Dunne. Formed when Local 544 split into CIO 544 and the more moderate AFL 544. Paper vowed “to carry on the militant labor traditions of its honorable predecessor.” It covered national CIO news and regularly criticized the AFL. Most of its pages were devoted to certification elections among furniture transport drivers and the trial of 29 leaders of Local 544-CIO and the Socialist Workers Party indicted under the Smith Act. As the trial progressed, the paper provided day-by-day coverage and reflected on different theories about the principles and the reasons behind the indictments. The publication ceased in 1942 due to lack of funds. Chicago, then New York. First published in 1935 this journal was the theoretical magazine of the Revolutionary Workers League in the U.S. It published for under a year when it became the Fourth International. Fourth International stopped publishing in 1939 when International News was relaunched but as the journal of the Organ of the Provisional International Contact Commission for the New Communist (Fourth) International. The journal was continuously published from 1940 until 1950 when the organization ceased to exist. London. This journal was originally published in 1958 as a duplicated theoretical magazine by the Socialist Review Group then working in the Labour Party. After one issue in that format the following two numbers were produced in 1959 as a joint issue in the form of a book length study of Rosa Luxemburg by Tony Cliff. In 1960 the journal resumed publication, this time in printed form, with an editorial board drawn from a variety of tendencies but retaining its link with the SRG, which became the International Socialists in 1962. The International Socialists were renamed the Socialist Workers Party 1977 and the magazine ceased publication in this format at the beginning of 1978 (No. 104) and was replaced by a book-format journal, which retained the name International Socialism but restarted the numbering, and a monthly magazine called Socialist Review. This index is divided into six parts: 1958–1968, 1969–1974 and 1975–1978 for ISJ (series 1) and 1978–1991 and 1991–2003 and 2003–2016 (under construction) for ISJ (series 2) Dublin/Belfast. A listing of various Trotskyist publications from groups affiliated to the United Secretariat of the Fourth International. London. Keep Left was the newspaper of the youth organized in support of the Socialist Labour League in Britain operating, initially, inside the Labour Party. In 1965, the SLL ceased doing entry work in the Labour Party. Keep Left them became the paper of the SLL youth organization, the Young Socialists. It ceased publication in 1985. We present below a very limited run of the paper that the Holt Labor Library had on hand. New York. Published by the Conference for Progressive Labor Action from January 1933 through December 15, 1934. It had replaced the CPLA organ, Labor Age, which had been published since the organization’s founding in 1929. The CPLA was a radical workers organization that engaged in union organizing and solidarity with striking workers. It included among it’s ranks A.J. Muste, George Breitman and Art Preis. When the CPLA fused with the Communist League of America, the groups’ papers were merged to became The New Militant. San Francisco. Published by the California Socialist Party from 1936 through early 1937. It was started as a voice for the Trotskyist dominated leadership of the party in California. The Trotskyists were particularly influential in the California labor movement and had been members of the Socialist Party nationally since the middle of 1936 when they dissolved the Workers Party of the U.S. in order enter en masse into the SP. Labor Action was edited by James P. Cannon having just arrived from editing the The Organizer, the newspaper of the fighting Teamsters Local 574 in Minneapolis, Minn. Labor Action had particularly good coverage of the Maritime Labor scene on the West Coast. New York. Published in the United States by the Workers Party a party founded as the result of a split with the Socialist Workers Party in the Spring of 1940 shortly after the SWP itself was founded. The major political issue was over the class nature of the U.S.S.R. with the majority of the SWP taking the position held by Leon Trotsky that this state was a workers’ state and not a state run by a “class of a new type” as advocated by those that formed the new Workers Party. The Workers Party’s most prominent member was Max Shachtman. Many writers that were previously associated with the SWP joined the new, but smaller, Workers Party, including James T. Farrell, Hal Draper, C.L.R. James and James Burnham (the latter of whom quickly abandoned all references to Marxism and moved to the far right of America’s political spectrum). After the Workers Party changed its name into the Independent Socialist League the paper continued under the editorship of Hal Draper until it ceased publication in 1958 when the ISL merged with the Socialist Party. Chicago. Publication of the Revolutionary Workers League for their work in the CIO and other unions. Appears to be a shortlived attempt to take advantage of the post-war strike wave in 1946. London. This journal was published from 1952 until 1963 by the tendency associated with Gerry Healy. Originally it appeared very sporadically but from 1957 it appeared more regularly. From 1957 until 1959 it was one of the finest non-sectarian theoretical journals on the left internationally. With the foundation of the Socialist Labour League it became increasingly inward looking and was replaced by a journal called Fourth International in 1964. New York/Chicago. Theoretical Organ of the Revolutionary Workers League of the US. New York, Chicago. This was the continuation in 1939 of Fourth International. The magazine ran only for a year in 1939 and then was replaced by the newer International News. New York. Published as the journal of the U.S. Trotskyist movement beginning with issue Vol. 1 No. 1, November 15, 1928. As the Trotskyist movement fused and split over the next 10 years, the paper, like the name of the movement itself, went trough several permunations (always published in New York): Communist League of America, 1928–34; New Militant, published by the Workers Party of the United States, December 15, 1934–June 6, 1937; Socialist Appeal (see below) from 1937 through 1941; The Militant, again, published by the Socialist Workers Party, 1941–present. For almost all of its existence the paper was a weekly, though sometimes it published 3 times a week during periods of acute political crisis, either in the U.S. or internationally. London: Published by the Socialist Labour League (Gerry Healy, Mike Banda, etc.) from 1956 until 1969, when it was replaced by the daily Workers Press. Initially weekly, then bi-weekly. Published as a broadsheet for most of its existence. New York. This magazine was founded as the organ of the Trotskyist group, named the Communist League of America, which formed out of a split from the Communist Party. The CLA merged with the American Workers Party (a left-socialist group led by A.J. Muste, James Burnham et al. ), to form the Workers Party of the US (January 1935 issue). The magazine was suspended (last issue: June 1936) when the Trotskyists joined the Socialist Party and was reissued (January 1938) when they split with the Socialist Party, forming the Socialist Workers Party. The SWP in turn split in the spring of 1940, and the magazine went (April 1940) with the then minority, which organized itself under the name of Workers Party. This organization changed its name to Independent Socialist League after April 1949. Throughout these political changes, the formal publisher of the magazine was the “New International Publishing Company” (except for the first year, 1934, when it was the “New International Publishing Association”). At present the index by issue is more or less complete. It is divided into three sections: 1934–1940 (until the split), 1940–1946 and 1947–1958 (when the magazine ceased publication). Minneapolis. Northwest Labor Unity Conference, 1935–36; Minneapolis Teamsters’ Joint Council, 1936–41; Local 544-CIO (1941) weekly. It represented arguably the most class-struggle oriented union in the United States. Editors included Pat Corcoran, Farrell Dobbs, Jack Smith, and Miles Dunne. Succeeded The Organizer. The Trotskyist-led paper served the militant labor movement of the Upper Midwest and was not strictly connected to one particular party. Most of its space was devoted to the activities of Teamsters Local 574 (later 544) and its various sections. The paper both chronicled and aided Local 574/544’s successful efforts to unionize workers and support strikes. Its pages also carried the heated debates and conflicts surrounding tactics and philosophies of different organizations, such as the AFL, the Communist Party, the Socialist Workers Party, the F-LP, and the CIO. The paper ceased publication in 1941 following Local 544’s split into CIO 544 and AFL 544 and was replaced by the Industrial Organizer (CIO 544) and Minnesota Teamsters (AFL 544). Minneapolis. Teamsters’ Local 574 (General Drivers and Helpers Union), 1934. Weekly and daily. Strike bulletin of the General Drivers and Helpers Union during the Minneapolis truck drivers’ strike of 1934· Edited by Trotskyist Communist League of America organizer Farrell Dobbs. The bulletin chronicled the events and grievances leading up to the strike, provided daily coverage of the strike when it began in July, and continued with weekly coverage of the union after the strike was settled. The bulletin also featured two regular columns: The National Picket Line, devoted to labor developments around the country, and Labor Looks at the Press, reprints of stories and editorials from the mainstream press, with commentary. Herbert Solow contributed often to the bulletin. Succeeded by the Northwest Organizer in 1935. London. Theoretical journal of the Workers Power group in the UK in the 1980s. New York. Journals of the League for the Revolutionary Party. A Trotskyist tendency that had its origins in the Revolutionary Socialist League and was expelled from that oganization in 1976. This page contains a complete collection as well as other articles from the LRP. New York. Published by the Young Peoples Socialist League, the Student Section of the Socialist Workers Party (US) in 1939, mostly for NYC college campuses. London. Representing a split from the Socialist Workers Party and IS tradition they gravitated away from Trotskyism toward an independent theoretical and programmatic Marxist line. London. Organ of the Communist League of Great Britain and then the Marxist League, British Section of the International Left Opposition – Fourth International, from 1933–1937. One of the first Trotskyist journals published in the GB. London. Representing the “Fourth International-Posadas” this current was the former Latin American sections of the International Secretariat of the Fourth International led by Juan Posadas, who split from the reunification effort in 1963 to set up his own international. The Red Flag was his English language outlet for his writings. London. Organ of the International Marxist Group. Founded in March 1970 after a split in the Black Dwarf editorial board, it was initially not explicitly an IMG paper but by September 1970 the IMG had taken control of the paper. It was renamed/replaced by Red Weekly in May 1973, was again renamed/replaced by Socialist Challenge in in June 1977 and eventually became/was replaced by Socialist Action in March 1983 after the organisation entered the Labour Party. The name changes tended to reflect changes in the organisation’s orientation and the ascendancy of different factions within the organisation, which eventually disintegrated after the British Miners’ Strike 1984–85 and, as far as we can ascertain, the paper ceased publication during the 1990s, although (at the time of writing (March 2013) there is still a Socialist Action website. London. Newspaper published between May 1973 and 1977 by International Marxist Group, British Section of the United Secretariat of the Fourth International. It is a direct descendant of the Red Mole described to the left. Additionally we have placed on line in this same section, the Battle of Ideas, the Red Weekly theoretical and polemical supplement. They are listed in order of appearance. This archive is created by Red Mole Rising blog and archive. We thank Rob Marsden, the curator of this site, for his encouragement and permission in mirroring the works at Red Mole Rising. New York. Journal of the Revolutionary Communist Youth, in political solidarity with the Spartacist League, US. New York. Journal of the supporters of the US Spartacist League inside the Worker-Student Alliance in SDS. New York. Newspaper of CUNY (City University of New York) students from the Revolutionary Reconstruction Club and Internationalist Clubs, for the program of Marx, Lenin and Trotsky, published in accord with the Internationalist Group, U.S. section of the League for the Fourth International. Chicago. The journal of the Revolutionary Workers League lead by Thomas Stamm. This was a split from a larger organization in the 1930s led by Hugo Oehler with the exact same name. The RWL has its origin in the Workers Party of the U.S. (the Trotskyist organization that became the SWP) in 1935. Both RWLs ceased to exist after 1950. London. This newspaper was published by the League for Socialist Action in Britain starting in 1976. It consisted of a group of members of the reunified Fourth International who split from the International Marxist Group in that year in support of the American Socialist Workers Party’s tendency in the International. 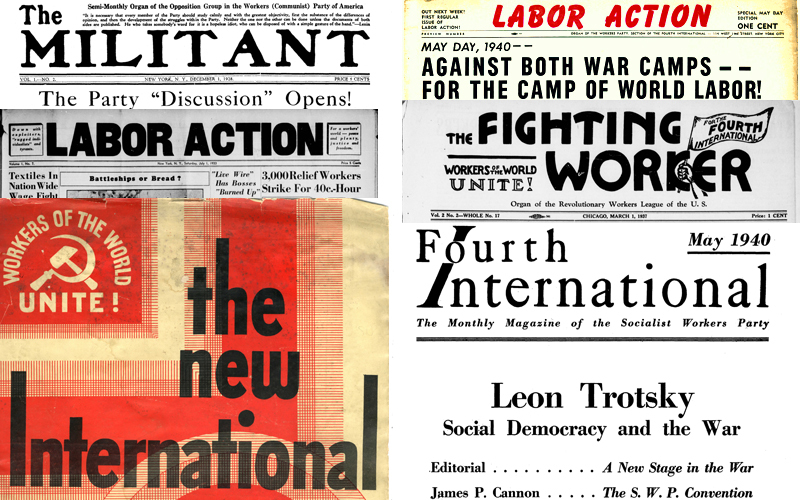 Its publication, Socialist Action, was produced several times each year. Its pamphlets included Abortion – a Woman’s Right! (1975); The Labour Party (1976); and Revolution in the Americas (1981). It engaged in entrism in the Labour Party in the period after 1976, and merged again with the International Marxist Group in 1982. San Francisco: Monthly organ of the group with the same name, affiliated with the United Secretariat of the Fourth International. From a split in/expulsion from the Socialist Workers Party in 1983. Chicago. This magazine was started by Albert Goldman, a supporter the Trotskyist movement in the United States, who formally left the Workers Party of the United States, the US Section of the International Left Opposition, to enter into the Socialist Party of America and work and develop this party’s left-wing, which had been growing under the impact of the Depression. The paper was started in 1935 and was shortly joined by the official membership of the Trotskyist movement in the U.S. led by James P. Cannon. The Trotskyists stopped publishing their organ, The New Militant and joined in publishing Socialist Appeal. Socialist Appeal remained the Trotskyist faction’s paper through when its resources were merged with the Socialist Appeal, a broadsheet published by the Trotskyist led left wing of the SP in New York City. Socialist Appeal in Chicago stopped publishing in 1937, its resources merging with the New York broadsheet of the same name. London. Journal of the Socialist Action group, affiliated to the United Secretariat of the Fourth International. Grew out of splits in the International Marxist Group. Eventually became staff and advisors for London mayor Ken Livingston. London. Organ of the Workers International League, one of two Trotskyist organisations in Britain during WWII and shortly therafter. Unlike the other group, the Revolutionary Socialist League, this one remained unaffiliated to the Fourth International. Lead by Gerry Healy, among others. New York. Officially sub-titled as the “Organ of the Socialist Party of New York, Left Wing Branches” with the same editorial positions as the Chicago Socialist Appeal, noted above. The first issue of this paper is from August 14, 1937, Vol. 1, No. 1. This New York Socialist Appeal was published as a broadsheet weekly. After the Left Wing’s Branches were expelled from the SP, they went on to establish the Socialist Workers Party in January of 1938 and Socialist Appeal became the official party organ. Socialist Appeal was changed back to The Militant in 1941. The last issue is noted as Vol. 5 No. 4, January 25, 1941. The index for this paper is listed in The Militant index as it’s a continuation of the same political tendency that originally put out the The Militant in 1928. London. Organ of the International Marxist Group, British Section of the Fourth International (USFI) and a continuation of Red Weekly. Eventually became/was replaced by Socialist Action in March 1983 after the organisation entered the Labour Party. The name chages tended to reflect changes in the organisation’s orientation and the ascendancy of different factions within the organisation, which eventually disintegrated after the British Miners’ Strike 1984–85 and, as far as we can ascertain, the paper ceased publication during the 1990s. London. Organ of the Socialist Labor Group, British Section of the Organizing Committee for the Reconstruction of the Fourth International. London. Organ of the “Continuity” Workers Revolutionary Party, British Section of the International Committee of the Fourth International. This became the Communist League and later the Socialist Future Group. London. This newspaper was published by the Socialist Fellowship from December 1948 until 1954. For much of that period, it was edited by John Lawrence and was formally published by an association of left wing members of the Labour Party. The paper’s editorial policy was controlled by a group around Gerry Healy. This Trotskyist group was privately known as The Club. Socialist Outlook was banned by the Labour Party's National Executive Committee in late 1954 and soon expired. The Club moved to selling Tribune instead. London. Published by the Socialist Group which was formed by Alan Thornett, John Lister and others who had been in the Workers Socialist League. After a period of working together with the former members of the International Marxist Group organized into the International Group, and an extended fusion process, the two groups came together to form the International Socialist Group and established the magazine Socialist Outlook. Various. In 1950 a small group of revolutionaries expelled from the British Trotskyist movement by Gerry Healy for what was later called “state capitalist revisionism” established a group and brought out a duplicated magazine called Socialist Review. Later it was printed and eventually came out in newspaper format. The group became known as the Socialist Review Group and although during the period of publication the group never numbered more than about 100 members, it nevertheless nurtured a number of people who went on to play an influential role in British politics and elsewhere. In addition to the theoreticians Tony Cliff and Michael Kidron, who laid the basis for the International Socialist tradition, these included the labour historian Raymond Challinor, the translator Peter Sedgwick, the mathematician Seymour Papert, the philosopher Alasdair MacIntyre, the trade unionist Bernard Dix and the politicians Stan Newens and Sid Bidwell. It also provided a forum for non-members such as Henry Collins and Eric Heffer. Publication ceased in 1962 after its role was replaced by the theoretical journal International Socialism and the agitational paper Industrial Worker (later Labour Worker, and later still Socialist Worker) – both of which are still being published today. London. In 1978 the Socialist Workers Party (formerly the International Socialists) revived the title Socialist Review as a monthly magazine to supplement the quarterly theoretical journal, International Socialism, and the agitational weekly paper, Socialist Worker. The magazine has appeared more or less continuously since then, although between September 1984 and July/August 1991 it was called Socialist Worker Review. Manchester/Birmingham. Organ of the International Socialist League, British Section of the International Workers League – Fourth International (Morenoist). London. A British publication produced between 1984 and 1987 by former supporters of the Workers Socialist League, a current that had, originally, been expelled from the Workers Revolution Party led by Gerry Healy. The WSL, which came off quite badly from an ill-conceived fusion with Sean Matagma’s International Communist League formed the Socialist Group with Socialist Viewpoint as its organ, before it fused in 1987 with the International Group to form the International Socialist Group, a section of the United Secretariat of the Fourth International. Chicago. Monthly organ of the International Socialist Organization, and organization that arose out a split in the International Socialist group in 1976. While the ISO itself focused on campus activities a large focus in Socialist Worker was on the growing ferment in the late 1970s and early 1980s in some of the largest trade unions in the U.S. and the various rank-and-file movements there. Chicago. This magazine was launched by the Politics Club of the University of Chicago at a time when radical student activities were making a new beginning in the postwar period but no student movement had yet appeared on a national scale. In many ways the University of Chicago campus was to the late ’40s and ’50s was what CCNY had been in the ’30s and Berkeley was going to be in the ’60s: the campus with the most activity of a “student movement” type. The focus of this activity was the Politics Club. Its relatively large membership was more heterogeneous than radical clubs had tended to be. It included socialists of various tendencies and even some liberals; but the largest single political current in the club was that of the youth group of the Independent Socialist League, called the Socialist Youth League. It was their views which gave the main political tone to Student Partisan New York. Theoretical Journal of the Spartacist League. Published in journal format and in newsprint form the magazine has appeared irregularly for 50 years. New York. Organ of the Socialist Youth League which was the youth group of the Independent Socialist League, lad by Max Shachtman and Hal Draper among many other socialist intellectuals of the 1950s. London. Socialist Women was published by the International Marxist Group, the British Section of the USFI in the throughout the 1970s. London. A semi-internal discussion bulletin of the Workers Power group in Britain. London. A theoretical magazine of the Workers Power group in Britain. New York. Journal of the Vanguard Newsletter organization and Class Struggle League, a 1969 split out of the U.S. Spartacist League, based in New York City. The publication run was from 1969–1973 and edited by Harry Turner. London. Published by the VSC by the supporters of the United Secretariat of the Fourth International in the GB. Started by Ralph Schoenman as spokesperson for the Bertrand Russell Peace Foundation, the VSC represented the leftwing of the Vietnamese Solidarity Movement in Britain. London. Published by the International Marxist Group as a world news service for British readers. It sort of competed with World Outlook, published by the United Secretariat of the Fourth International in Paris and edited by Joseph and Reba Hansen in Paris. Included are some misc. issues of other international publications of the USFI published in Britain by the International Group or IMG including the The Internationalist (1 issue) and Information Bulletin not to be confused with the other publication of the same name. Originally published Emeryville, CA., and called “Publication of the Committee for a Labor Party”, it later moved to New York City. July 1968 through September of 1971 when its name changed to Workers Vanguard. First publication of the Spartacist League, focusing on work in the unions on the West Coast of the U.S. Edited by Jeff White. London. Published by former supporters of the Workers International League, itself composed of former supporters of Gerry Healy’s Workers Revolutionary Party, Workers Action was one of the many groups spun off form the latter’s destruction in 1985. London. Newspaper of the Workers Fight tendency that evolved out of the Revolutionary Socialist League better known as Militant. The paper ran from 1967 through May of 1976. This was the first tendency that later gave rise, through a series of splits and fusions, the Alliance for Workers Liberty. We have only a very fragmentary collection of the journal. The Workers Press was the continuation of The Newsletter, the publication of the Socialist Labour League in the UK., in 1969. It was eventually replaced by Newsline, also a daily, in the early 1970s. London. Workers’ International League, 1938–1944; Revolutionary Communist Party, 1944–1949. Monthly, later irregular. Theroretical organ of the WIL and then the RCP until the dissolution of the party in 1949. London. Paper of the Workers International League in the GB, a split from the Workers Revolutionary Party. We present a near complete run of the WIL’s paper Workers News which ran for 60 issues and was notable for its combination of agitational articles and movement reports with long theoretical, historical and polemical articles which ran over several issues – including Bob Pitt’s monumental series on the rise and fall of Gerry Healy in no fewer than 26 parts! London. Newspaper of the Workers Power group in the UK. London. Theoretical journal of the Workers Power group in the UK. Berkeley/New York. Journals of the International Socialists tendency in the U.S. which published continuously under these 3 names from 1967 through 1978. New York. Journal of the Spartacist League. Bi-weekly though in the 1970s often published weekly. Paris, New York City. World Outlook was published by Pierre Frank, Joseph and Reba Hansen. It was published in 1963 under the auspices of newly created United Secretariat of the Fourth International. Published out Paris it was eventually moved to New York City and published by the US Socialist Workers Party as a fraternal courtesy to the USFI. With the change of location it started, under Joseph Hansen’s editorship, reflecting the politics of the SWP and away from the strictly European USFI influence. In 1968 it was renamed Intercontinental Press. Initially World Outlook started publishing twice-monthly, then within a few months started publishing weekly. The reporting in the magazine focused on the goings on and activities of the world Trotskyist movement in the 1960s as well as analysis of the major events of the period, from the Cuban Missile Crisis through counter-revolutionary coup in Indonesia in 1965 to the rise of the May events in France in 1968. London. Publication of the Alliance for Workers Liberty. The group has been identified with the theorist Sean Matgamna throughout its history. It emphasises working-class political independence, radical democracy and anti-Stalinism. The AWL publishes the newspaper Solidarity. The AWL traces its origins to the document What we are and what we must become, written by the tendency's founder Sean Matgamna in 1966 in which he argued that the Revolutionary Socialist League, by then effectively the Militant tendency, was too inward looking and needed to become more activist in its orientation. The RSL refused to circulate the document and, with a handful of supporters, he left to form the Workers' Fight group. Espousing left unity, they accepted an offer in 1968 to form a faction within the International Socialists as the Trotskyist Tendency but being expelled from the IS 3 years later. Broader left paper published by socialist students active in the Labour Party Young Socialists. Many of the editors found their way into the various large GB Trotskyist groups. New York. Newspaper of the of Young Socialist Alliance, youth organization of the Socialist Workers Party. Colombo, Ceylon. Newspaper of the Lanka Sama Samaja Party youth group. New York. Newspaper of the Spartacus Youth League, National Youth Committee of the Communist League of America. First Trotskyist youth organization in the U.S. Organ of the Spartacus Youth League, youth section of the Spartacist League/U.S. Continuance from the Revolutionary Communist Youth Newsletter. List of English language Trotskyist or Trotskyist-influenced periodicals that are digitized but not yet organized for uploading, not yet digitized, or currently unavailable for scanning and digitization. Some of the publications that are still publishing could have websites containing their archives. Direct Action: Sydney, originally the paper of the Socialist Workers Party, Section of the United Secretariat of the Fourth International, later the the Democratic Socialist Party. Marxist Left Review: Sydney, twice-yearly theoretical magazine of Socialist Alternative. Red Flag: Sydney, orginally the paper of the Revolutionary Socialist Party, spit from the DSP, after the merger of the RSP with the Socialist Alternative group, the paper became the organ of the new fused party. Fight Racism! Fight Imperialism!, London: Bi-monthly paper of the Revolutionary Communist Group (no longer identifies with Trotskyism). In Defense of Marxism, London: Quarterly theoretical journal of the the Socialist Appeal group, affiliated to the International Marxist Tendency. Living Marxism, London: Theoretical Journal of the Revolutionary Communist Party (1970/80s). Split from the International Socialists. Ceased calling itself Trotskyist after a short period. Militant, London: Newspaper of Militant, which was a tendency in the British Labour Party, affiliated to the Committee for a Workers International. Newsline, London: Daily organ of the Workers Revolutionary Party (Gerry Healy). Continuation of Workers Press. Remained newspaper of of one WRP faction after the organization blew up in 1985. Socialism Today, London: Monthly theoretical magazine of the Socialist Party of England and Wales, affiliated to the Committee for a Workers International. The Socialist, London: Weekly of the Socialist Party of England and Wales, affiliated to the Committee for a Workers International. Formerly Militant. Socialist Appeal London: Monthly newspaper of the group with the same name, affiliated to the International Marxist Tendency and www.marxist.com. Socialist Organiser, London: was a weekly socialist newspaper circulated in the Labour Party. The newspaper was founded in 1979 by the Socialist Campaign for a Labour Victory, later renamed the Socialist Organiser Alliance. The newspaper was originally a vehicle for united work between the International Communist League (ICL), the Workers' Socialist League (who merged with the ICL to become a new SL), Workers Power and independent leftists, such as Ken Livingstone. Socialist Press, London: tabloid organ of the Workers Socialist League in the 1970s and early 1980s, split from the Workers Revolutionary Party. Socialist Resistance, London: newspaper of Socialist Resistance affiliated to the United Secretariat of the Fourth International. Socialist Worker London: Weekly newspaper of the Socialist Workers Party. First published in 1964 as Labour Worker. Workers Power, London: monthly paper of the Workers Power group. Young Socialist, London: Weekly newspaper of the Young Socialists associated with the Workers Revolutionary Party. Workers Vanguard, Toronto: Newsaper of the Canadian Trotskyist organization in the 1950s. Labor Challenge, Toronto: Organ of the League for Socialist Action. Peoples Democracy, Belfast: paper originally out of northern Ireland and growing out of the New Left it becasme the Irish Section of the United Sectretariat of the Fourth International in 1981 with the same name. Class War, organ of the Communist Workers Group in New Zealand. Spark, organ of the Workers Party of South Africa, Section of the Fourth International, during the 1930s. Torch, paper of the Non-European Unity Movement, an anti-racist and anti-colonial organization influenced by the South African Trotskyists, during the 1940s and 1950s. State, English language version of the the LSSP’s theorectical journal Rajaya. Alarm, Minneapolis: Scandinavian Propaganda League of the IWW, 1915–18. Monthly and semimonthly. In Swedish, Danish and Norwegian. Editors included Carl Ahlteen, Walfrid Engdahl and Carl Skogland. Suceeded Solidaritet, a short-lived Swedish IWW publication from Seattle. Paper covered events involving the IWW and the Scandinavian Socialist Federation in Minnesota and reported regularly on the unionization of workers in various industries. The paper opposed US entry into WWI, and in 1917, Ahlteen and two others were arrested and charged with impeding the conduct of the war. The paper lost its second-class mailing permit and ceased in 1918. It was succeeded by Facklan. Bulletin In Defense of Marxism, New York: Bulletin of the Fourth International Tendency, a public faction of the Socialist Workers Party (US), formed after the 1983 expulsion from that organization. Folded into Against the Current in 1995 as the FIT folded into Solidarity. Class Struggle, Oakland/Bay Area: Organ of the Communist Workers Group, focusing on internationalist news and analysis. Class War, Oakland/Bay Area: Theoretical journal of the Communist Workers Group. Based in New Zealand and East Bay in the United States. Fighting Worker, Detroit: Newspaper of the Revolutionary Workers League, a group of independent origin that started in Michagan, U.S., in the late 1970s. Affliated for a period of time with the Trotskyist International Liaison Committee. Intercontinental Press (formerly World Outlook), Paris, then New York (1964 through 1980): Weekly, later bi-weekly publication of the United Secretariat of the Fourth International established after the majority of the International Committee merged with the International Secretariat. Edited by Joseph Hansen of the U.S. SWP. Considered a highly informed but internally factional newsweekly of international affairs. Labor Militant, New York: Original journal of the Labor Militant tendency in the U.S. Later Socialist Alternative. Minnesota Appeal, Minneapolis SWP, Minnesota Section, 1939–(? ): frequency unknown. Paper vehemently opposed President Franklin Roosevelt, the New Deal, and the Communist Party, considering the Communist Party to be a tool of the war-mongering Roosevelt. Also critical of the F-LP. No editor named. The Organizer, San Francisco: Magazine of Socialist Organizer, U.S. Section of the Fourth International, founded in 1992. Perspective Mundial, New York: Spanish language monthly of the U.S. SWP. Lasted 1970s through mid-1980s. Red Tide: Journal of the International Socialists’ youth organization of the same name. Revolution, New York: Tabloid of the youth in solidarity with the Internationalist Group. Socialist Appeal, Minneapolis: Newspaper of the Workers International League, affiliated to the International Marxist Tendency. Socialist Viewpoint, San Francisco: Monthly magazine, originally, of the Socialist Workers Organization, a split from Socialist Action in the early 2000s. Now an independent magazine. The Torch, New York: Newsaper of Revolutionary Socialist League. Unionist, Austin (Texas): Independent Union of All Workers, 1935–37; Packinghouse Workers Organizing Committee, 1937–40; Local 9 (United Packinghouse Workers of America), 1940–79; Local P-9 of the United Food and Commercial Workers, 1979–present. Weekly. Editors included Carl Nilson and Svend Godfredsen. Paper began as organ of the IUAW and maintained its militant tone into the early 1940s, containing within its pages the diverse voices of Communists, Trotskyists, Socialists, and trade unionists. Paper covered CIO national news and activities and meetings of locals, as well as some general news. Paper carried many regular columns of political commentary, hunting and fishing tips, movie reviews, and cartoons. Workers Voice, San Francisco: Newsaper of a short live group of the same name. Briefly affiliated with the British Workers Power organization. Working Class Opposition/El Bolsheviki, Los Angeles/San Francisco: Bi-lingual monthly of the Internationalist Worker Party, the former section of the Internationalist Workers League-Fourth International. Young Socialist, New York: Newspaper of the Young Socialists associated with the Workers League.